Broken Thunder is an unofficial sequel of Thunder Force VI, developed and released by Factory Noise & AG on May 3, 2007. According to the developer the game was incomplete, therefore it quickly withdrawn for sale. Currently, there are only few online stores that serve orders, but exclusive in Japan only. The game will available both a limited edition collector’s package that includes the original score by Thunder Force fan favorite Factory Noise & AG, and a regular version that will be released without the bonuses. 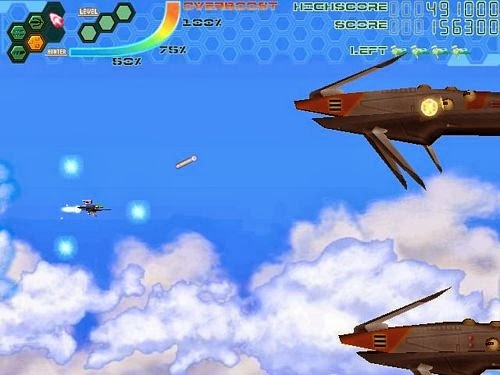 While the game is not officially licensed Thunder Force project, the names of the ships, weapons and the story are going to be all familiar to Thunder Force fans. The only letdown is player can’t select their starting stage. 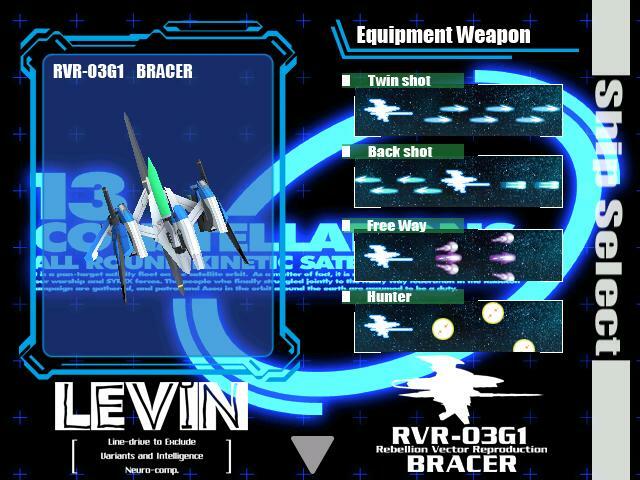 Player can select two ships: RVR-03G1 “Bracer”, the main fighter of the 13 Constellations ARKS Force. “RVR” stands for “Rebellion Vector Reproduction”. It’s pilot is Sonya T. Soroka. The second fighter is Fire LEO-05VC “Syrex”, the latest Fire LEO unit developed by 13 Constellations ARKS, but non-canonical in the Thunder Force story and timeline. It’s pilot is Wolf Brandish. Twin Shot, Basic weapon of both Bracer, Broken Thunder and Syrex, it fires two parallel lasers. Back Shot, Fires lasers from behind your ship. Available for all ships. Wave, Fires crescent shaped lasers. Only available for Syrex and Broken Thunder. Freeway, Fires 3 powerful lasers in specific direction and its aim can rotate 360º. Considered as the strongest weapon and only available for Bracer and Broken Thunder. Vector Cutter, A short-range powerful blade weapon for cut enemies. Only available for Syrex and Broken Thunder. Hunter, Thunder Force traditional weapon. A homing missiles that capable of following enemies and shooting it down. CRAWs, Constitutional Ray Art Weapon units. Rotate around the player’s ship and act as extra turrets for main weapons. The Over Weapon also exist in Broken Thunder, and this feature is based upon Thunder Force V. The original Over Weapon combines the player’s CRAWs with current selected weapon to create a more powerful version of that weapon. Over Weapons can only be sustained for a limited period of time by using CRAWs energy. In Broken Thunder Over Weapon burns 1/3 of a CRAW in a forced blast, like a bomb format. Unfortunately, when player use it against strong enemies and bosses, they’ll just move away during a blast turning out into a waste of power. As a doujin game, Broken Thunder looks excellent with high quality video at 800x600 resolution. The best part of the game is re-arranged soundtrack by Tsukumo Hyakutaro, Noise band member and music composer for many of Tecno Soft’s games (including Thunder Force V).